Adventure Time is a show about the adventures of Finn, the human, and Jake, the dog. Finn and Jake get into some crazy adventures along side their friends Princess Bubble and others. They live in a super colorful and imagination filled world where sometimes trouble erupts and Finn and Jake are the only ones there to save the day. The dreams of Finn, Jake, and BMO fall under the influence of a mysterious orb. Horse and Ball: When disaster befalls James Baxter, it's up to Finn and Jake to help him pick up the pieces. / Jelly Beans Have Power: Princess Bubblegum's scientific mind must wrestle with her Elemental magic potential when she's faced with a Crystal Entity. Wheels: Kim Kil Whan is worried about his daughter's future and asks Jake for some parental advice. / High Strangeness: An otherworldly encounter puts Tree Trunks on the trail of a conspiracy in the Candy Kingdom. Two Swords: Finn and Jake contend with a mysterious, but familiar, new being. / Do No Harm: Finn makes amends at the Candy Hospital while Jake tries to connect with their unexpected houseguest. 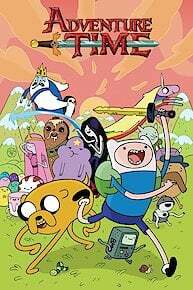 Pre-Boot: During an excavation of human artifacts, Finn, Jake and Susan Strong are greeted by a mysterious new stranger who may hold the key to the past. / Re-Boot: Finn and Jake must take on one of the fiercest enemies they've ever faced when a powerful ally goes rogue. The Music Hole: While judging the hugest Battle of the Bands in the history of Ooo, Finn hears a mysterious new song. / Daddy-Daughter Card Wars: To put his embarrassing past behind him, Jake needs his daughter Charlie's help to win an underground Card Wars tourney. Normal Man: Stripped of his magic powers, Normal Man enlists Finn and Jake's help to rescue his brother Glob. / Elemental: Ice King discovers something buried deep beneath the Ice Kingdom that could change Ooo forever. I am Sword: Finn starts having guilt nightmares about his missing Finn Sword...but are the nightmares real? / Bun Bun: Finn brings a special delivery for Cinnamon Bun to the Fire Kingdom but it may come with a dangerous cost. Beyond the Grotto: In pursuit of a runaway Sea Lard, Finn and Jake are led down a whirlpool to a curious new land. / Lady Rainicorn of the Crystal Dimension: Jake's son TV finds a hidden box and draws the attention of a super cool Rainicorn named Lee. While safeguarding a frightened Sweet P, Finn is led into a confrontation with an old foe. An unexpected critic shows up at Ice King's latest Fionna and Cake book reading. BMO and Marceline swap stories about their recent adventures. Broke His Crown: When Ice King's magic crown goes haywire, Marceline and Princess Bubblegum resort to extreme measures to help him. / Don't Look: At the top of Dead Mountain, Finn discovers a treasure that comes with a terrible price. Flute Spell: Jake learns that Finn's been having clandestine meetings with a powerful wizard. But what are they up to? / The Thin Yellow Line: Finn and Jake infiltrate the Banana Guard ranks and stumble upon a conspiracy. Crossover: Prismo needs Finn and Jake's help to stop a catastrophic event from happening somewhere in the multiverse. / Hall of Egress: Trapped and alone, Finn must unravel the riddle of the weird cave with no exit. A King's Ransom: Ice King suffers a heartbreaking loss and it's up to Finn and Jake to find the culprit. / Scamps: Finn takes a group of at-risk Candy Kingdom youth on a camping trip they'll never forget. Bad Jubies: There's a catastrophic storm, so Finn, LSP, and BMO decide to build a bunker for protection, but Jake has plans of his own... / Blank Eyed Girl: One very spooky night, Finn and Jake come face-to-face with an urban myth. Angel Face: BMO ropes his friends into a live action cowboy role-playing adventure! / President Porpoise Is Missing: Finn and Jake must find President Porpoise before Vice President Blowfish takes over! It's chaos under the sea! Moe visits the tree house with a special birthday surprise for BMO. While BMO's mission stands on thebrink of disaster, Finn & Jake host a strange guest. Cherry Cream Soda: With the arrival of an impossible visitor, Cherry Cream Soda's life is thrown into disarray. / Mama Said: When King of Ooo sends Finn and Jake on a mission to catch flying mushrooms, they find their loyalty tested. Bonnie & Neddy: Finn and Jake, acting on orders from Candy Kingdom's new ruler Princess King of Ooo, stumble upon one of the kingdom's greatest secrets. / Varmints: Bubblegum teams up with Marceline to face a threat to her homestead's citizens. Adventure Time is currently available to watch and stream on Cartoon Network. You can also buy, rent Adventure Time on demand at Hulu, Sling, DIRECTV NOW, iTunes online.